"Mårten Trotzigs gränd ("Alley of Mårten Trotzig") is an alley in the old town of Stockholm. The alley is named after the merchant and burgher Mårten Trotzig (1559-1617), who, born in Wittenberg, immigrated to Stockholm in 1581, and bought properties in the alley in 1597 and 1599, also opening a shop there. His original German name is said to have been Traubtzich, but he is also mentioned under various other names, such as Trutzich, Trutzigh, Trusick, Trotuitz, Tråtzich, Trotzigh, and Tråsse. According to sources from the late 16th century, he was dealing in first iron and later copper, by 1595 had sworn his burgher oath, and was later to become one of the richest merchants in Stockholm. He was however beaten to death during a trip to Kopparberg in 1617." 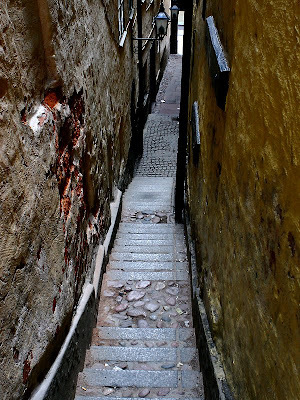 Leading from Västerlånggatan up to Prästgatan (the Priests street), the width of its 36 steps tapers down to a mere 90 cm, making the alley the narrowest street in Stockholm.